Rock Broom (Genista) - Some of these are good garden and rock garden shrubs, thriving in almost any soil which is not too wet, and readily raised from seeds. 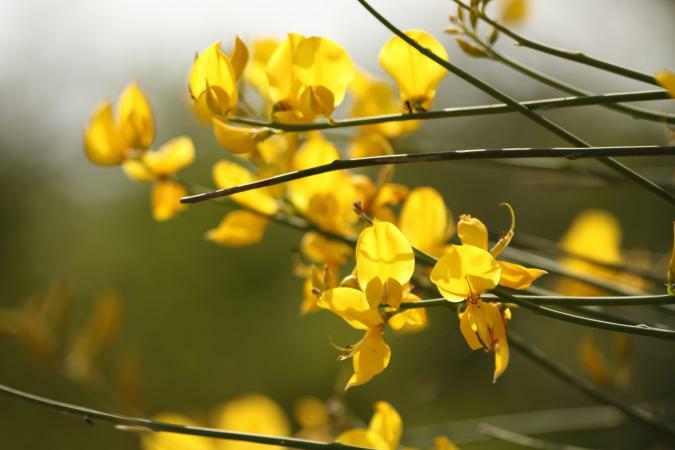 Genista Aetnensis - A native of Sicily, is one of the best kinds. In a young state the twigs are sparsely clothed with linear silky leaves, but when old no leaves are developed, and the green slender twigs perform the functions of leaves. An old tree-for this species attains a height of 12 feet or more-is a beautiful sight in July or August when in full flower. Needle Furze (Genista Anglica) - A prostrate spiny shrub, sometimes growing to a height of 2 feet, widely distributed throughout W. Europe, and in Britain occurring on moist moors from Ross southwards. The short leafy racemes of yellow flowers appear in May and June. Genista Aspalathoides - A native of S.W. Europe, makes a densely-branched, compact, spiny bush from 1 to 2 feet in height. It flowers in July and August, and is a good shrub for the rock garden. Genista Germanica - A species widely distributed throughout Europe, it makes a bright rock garden shrub not more than a couple of feet in height. It flowers very freely during the summer and autumn months, and the stems are inclined to arch when 1 foot or more high. Genista Hispanica - Native of S.W. Europe, and a compact under-shrub, evergreen from the color of its shoots. It scarcely attains more than 1 foot or 18 inches in height, and the crowded racemes of yellow flowers are borne at the tips of the spiny twigs from May onwards. Genista Pilosa - A dense, prostrate bush and a delightful rock garden plant. In Britain it is rare and local, being confined to gravelly heaths in the south and south-west of England. It grows freely and flowers abundantly in May and June. Genista Radiata - Native of C. and S. Europe, 3 or 4 feet in height, evergreen from the color of its much-branched spiny twigs. The terminal heads of bright yellow flowers are throughout the summer months. It is hardy in the south of England. Genista Sagittalis - A frequent plant on the alpine meadows of Europe. In habit it differs widely from any of the other kinds, the leaves being replaced by a winged stem. It scarcely grows a foot high, and forms a mass of branches bearing racemes of yellow flowers in May and June. Genista Tinctoria, aka Dyers Greenweed - Occurring in a wild state in Britain, it rarely exceeds 18 inches in height, and is a spineless shrub bearing a profusion of bright yellow flowers from July until September. Rock Broom can make a lovely addition to your rock garden. Check your local garden center to see if there's a variety that's suited to your region.